Congratulations to the Haldane family for completing the PADI Open Water Course together with Downbelow Instructor Victor. Now that all of them are certified divers, the Haldanes’ can go on diving trips and enjoy the amazing underwater world together! We are always happy to introduce our guests to the underwater world and even more so when qualifying a family as divers! 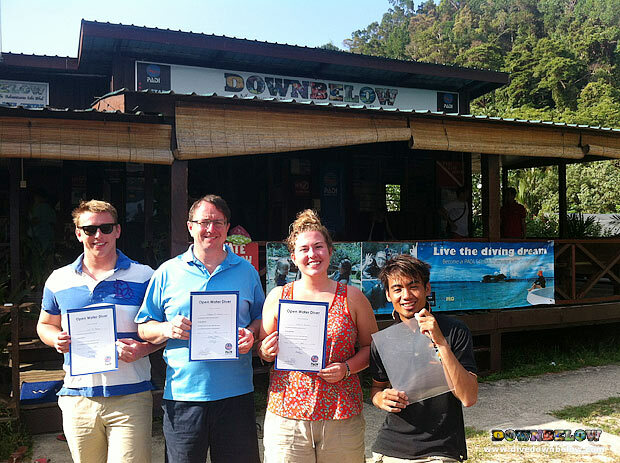 For the instructors at Downbelow, our passion for scuba diving training is evident in the high standard of training. The PADI Open Water course is an entry-level certification, which can be completed in 3 to 4 days to qualify a diver to dive to a maximum depth of 18 metres. With our wealth of experience, we help those who want to take up diving, no matter what their underwater experience is, we will help you to become a diver. Ready to see the world in a completely different view? Take up diving and enjoy the amazing colors of the underwater world! Contact us at Downbelow and we can help you make that first step into diving. We offer a variety of programs to recreational and professional divers alike to live their diving dream!